You are here: Home / Drag Racing Psychology / What is Racing Psychology? Discover how to quickly sharpen your race focus, boost confidence, and stay in control on the track! Dr. Patrick J. Cohn, race psychology expert, helps racers in all motor sports to improve mental toughness for racing to reach peak performance. 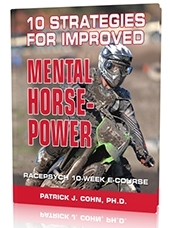 Please browse our mental training programs for auto racers, motorcycle racers, and motocross racers. You can also browse our racing psychology articles for racers. 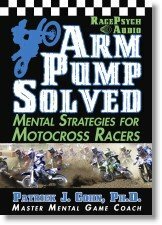 Dr. Cohn provides peak performance strategies for motocross, auto, and motorsports racers. Learn how to improve your performance by improving your mental game of racing using sports psychology strategies. Race psychology coaching and mental toughness training are necessary components to developing healthy attitudes and beliefs that improve racing performance and allow for consistent, winning performances! Below are some of the most frequently asked questions about sports psychology answered by leading sports psychology authority, Dr. Patrick Cohn. 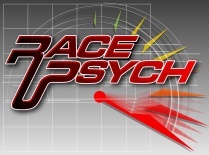 Racing psychology helps racers and teams apply mental skills for enhanced performance. Racing psychology helps drivers, riders, and teams develop confident, focused, and trusting mindsets for racing. 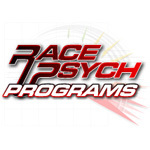 RacePsych is a coaching process to assess and help racers develop a mindset for racing success. We assess a driver’s mental aptitude using the Driver’s Mental Aptitude Profile (DMAP) to determine mental game strengths and weaknesses. Limiting beliefs and expectations are uprooted to free drivers to focus on what’s important in racing. A mental game plan is developed to help drivers and teams reach peak performance. Sports psychology is part of the larger field of exercise and sport science and studies human behavior in the sports environment. It also examines the effects of sport on the participant. The objective of sports psychology is to help athletes perform better by improving mental game skills through a process of mental game coaching or mental training. Sports psychology also addresses team dynamics by enhancing teamwork and communication. What is a Mental Toughness Coach? The difference between a mental game coach and an athletic team coach really depends on the coach. Great athletic team coaches such as Tommy Lasorda have mastered the art of mental game coaching. They know how to help their teams identify the mental obstacles that hold them back from optimum performance, and how to implement sports psychology strategies to help the team be motivated and confident. A mental game coach specializes on mental skills for peak performance and does not work on technique (e.g. physical skills training) or fitness as would a team coach. Why Work with Dr. Cohn and RacePsych? For more than 15 years, Dr. Cohn and Peak Performance Sports have helped athletes improve their performance through mental toughness coaching. Dr. Patrick J. Cohn is one of the nation’s leading mental game coaches, combining the knowledge gained from his Ph.D. in sports psychology, hands-on experience working with hundreds of athletes and more than 25 years experience as an athlete in football, hockey, baseball, tennis, lacrosse, and golf. He has worked with national champions in motocross to NASCAR winners.